Tips and techniques for making better compost with a tumbler. For years, I composted in heaps. Three piles — collected, turned, finished — three years from pitching it in to shoveling it out. And then I took a tumble. Yes, a tumbling composter has changed my life. 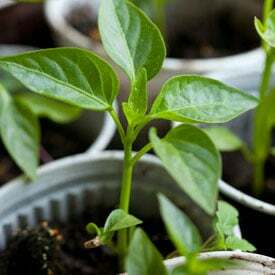 No longer do I wait several seasons to have rich, rewarding, garden-ready organic material to spread around my plants, add to my growing containers and enrich my precious, precious soil. No longer do I have to listen to my true love’s complaints — and, believe me (yes, dear), they’re well-informed complaints if just a bit misguided — that my piles are unsightly, surrounded by clouds of insects, odiferous (I call it “green perfume”), and offend the neighbors. Best of all, no longer do I strain my back turning the heaps with a garden fork or transferring compost from one heap to the next. Now, my compost is turned twice a week — or more — without back strain. How? By using a compost tumbler. What’s a composting tumbler? 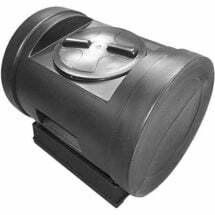 Simply described, it’s a barrel that can be rotated or turned. 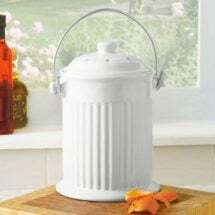 Often made from recycled plastics, the barrel is filled with organic yard and kitchen wastes. The composting process, contained within the barrel, is activated with commercial starters, manure, already finished compost, garden soil or nothing at all. The organic materials are broken down, as in the compost heap method, by zillions of microbes and other living organisms fueled by oxygen. To keep the process going at its fastest clip, the tumbler is turned twice or three times a week, mixing the microbes with the organic material while infusing fresh supplies of oxygen. The tumbler keeps the materials contained, as well as the heat the process generates. In a month or so — or even less with diligent practice and the right tumbler! — the lid is pulled from the barrel and voila! Fresh, rich compost that you’ve made yourself. Composting practices are thousands of years old and it’s difficult to say when the first tumblers were put to use. In the 1970s when the back-to-the-land movement was really taking off, a few innovative gardeners offered plans for barrels, “compost rollers” and other schemes for containing and turning compost. Commercial tumblers have been available for decades and the choices available have mushroomed over the last several years. Plans for making your own tumbler are also numerous. The commercial tumblers are mostly of two types: horizontal and vertical. Variations include spherical tumblers made to roll along the ground or contained on stands. 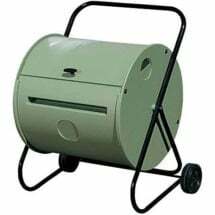 Sizes vary from large bins capable of holding bushels of yard waste to smaller barrels designed for back porch use. The simplest designs are basically rotating barrels. Some horizontal tumblers have cranks to facilitate turning. All are vented, more or less, to allow in fresh air to fuel the composting process. More sophisticated models use piping to bring oxygen to the center of the barrel and paddles inside the barrel to help mix and aerate the composting materials when turned. These improvement or modifications — call them what you will — are designed for one reason: to speed the composting process. How do compost tumblers work? Simple. You load them with green and brown waste from your yard and kitchen. When full, you give them time to work, in other words, heat up. Turning a compost pile — mixing the organic materials and the organisms it contains with heat-producing oxygen — is the traditional method of keeping the process going full steam. A tumbler does this more simply than the old strong-back-and-garden-fork method. By turning the tumbler, the organic materials are mixed and infused with fresh oxygen. When a check reveals the compost is complete — and this can happen in a matter of weeks — the same access that allowed you to fill the tumbler lets you empty it. Now’s the time to spread the results. What should you consider when buying a tumbler? First, how much compostable organic material do you produce? Most barrels will take the grass clippings from a moderate sized yard with ease, depending on your mowing habits or how tall you let your lawn get. A yard with several large deciduous trees will probably produce more leaves than any single tumbler can hold, especially when considering the carbon-to-nitrogen ratio of green to brown material. If you’re composting mostly kitchen scraps and only small amounts of yard waste, you’ll want one of the smaller barrels or, again, because of the carbon-nitrogen ratio, you’ll choose to use another method altogether. Our recommendation: start with the largest composter you think you can use. There are always yard trimmings to be collected from neighbors and other sources if you can’t fill it on your own. If you have an abundance of green material to compost, consider two tumblers. This way you can stagger the process, loading one of the barrels while the other is in the throes of composting. Producing more compost is a good thing. 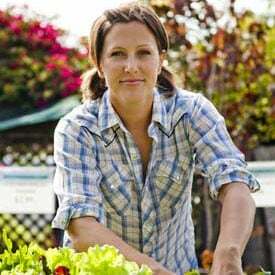 Even after you’ve dressed your garden plots, used it to mulch your shrubs and hedges and spread it on your lawn, there’s always a neighbor who will gladly take any extra you’ve produced for her own gardening needs. Another consideration: while tumblers make turning compost easier than turning it by hand, they still require a bit of strength. If you have severe back, shoulder or strength issues, you may find turning large, full compost tumblers more than you want to handle. Consider the smaller tumblers or those that are rolled along the ground. For the most part, tumblers are easily turned. You’ll find it easier if you give them a back-and-forth swing or two to get them moving before completely turning them over. This is true even with crank-turned models. Also, consider how high your yard waste and other materials need to be lifted to get into the composter. The closer to the ground your tumbler’s lid, the easier it is to load. Unloading is also a consideration. Some tumblers load and unload from the same access. Others top load but empty from the bottom. Venting is very important. 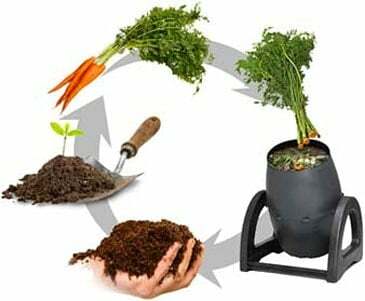 The more air your compost is exposed to the faster the process. Too little air turns your aerobic process into an anaerobic process, which leaves behind a messy, often smelly (but still useful) product. 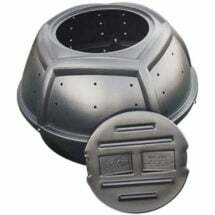 Choose compost tumblers that are well-vented. Some composters modify their tumblers to allow for more air flow. Before poking additional holes in the barrel, do a test load with your tumbler. If your compost doesn’t heat up to at least 130˚F or if the process takes significantly more time than indicated in your tumbler’s directions, then more venting may be required. (Remember that other factors also contribute to the time it takes to make compost, especially the size of the materials composted, their green-brown or nitrogen-carbon ratio and moisture content.) Extra holes may speed the composting process. Exceptional capacity — 12 cubic feet! The EZ-Tumbler Compost Wizard is a dream to turn, it kicks out finished compost in about two weeks, and it keeps the critters out of your food scraps. Load it up, spin once a week, and you’re done! 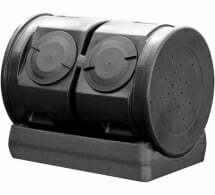 Vents or outlets on the ends of a vertical tumbler allow excess liquid to drain from the compost. A pan or small bucket can be used to collect these drippings — compost tea! — which can be a safe, nutrient-rich amendment when applied to the base of plants during watering. Commercial tumblers go together easily and require just a screwdriver and pliers to assemble. Most barrels come in two pieces. Make sure that when you screw them together that you do it tightly or else your compost tea will leak out the seam when the tumbler is turned. The stand or legs should also be assembled securely. They’ll be asked to support a lot of weight and occasionally asked to stay together while you drag your tumbler to a slightly different position. Make sure the axle is secure to the legs. You don’t want the barrel separating from its legs when turned. A level base is best for your tumbler but most will tolerate a slight slant or uneven ground. Using your compost tumbler appears to be easy. Load it to capacity, add inoculant — something to jumpstart the process with the needed microbes such as a spadeful of garden soil, manure, a commercial activator or already finished compost — and turn it every couple days. But for best results, a little care is required. What you load into your composter is most important. General rules do apply. What not to compost? Twigs or other woody prunings or protein foods such as meat, fat, dairy products or fish as well as bones and pet droppings. Be aware of any pesticide, herbicide or fertilizer that may have been applied to your compostable material. Even though the microbes involved in the composting process tend to neutralize some contaminants, any source of possible contamination should be kept out of your barrel. You can obsess about the specific carbon-nitrogen ratio inside your composter — good finished compost has a C-N ratio of 10-1 — or you can go for a good brown-green ratio and let nature take its course. 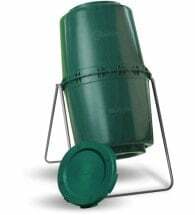 Most compost tumblers recommend that you load your barrel with roughly 75 percent grass clippings or green equivalent and 25 percent other ingredients such as kitchen scraps. This varies from the traditional brown-green mix in open piles or heaps. Why? Because the mostly closed tumbler system affords less chance for evaporation. Too much moisture in a tumbler’s barrel — and kitchen scraps such as vegetable peelings, coffee grounds and tea bags contain a lot of moisture — yields a runny, muddy almost putrid product. If your product is too wet, try adding dry leaves or newspaper scraps. In worst case scenarios, empty the bin and start over. Rule of thumb: finished compost should have the moisture content of a well-squeezed sponge. Lack of moisture can also be a problem. If the inside of your barrel is completely dry, as it might be when you’ve filled in completely with fall leaves, then add kitchen scraps or, more directly, a quart or two of water. Give your barrel several good tumbles to distribute the moisture. Size does matter. The smaller the particles that go in your tumbler, the hotter and faster your process (see Composting Physics). I’ve loaded a tumbler with tall pulled weeds and waited almost a season for finished compost. Worse, the compost didn’t heat up enough to kill the weed seeds. Feeding your compostable material through a shredder or — more economically — running over it a few times with a lawn mower helps speed up the decomposition process. At some point, it’s time to stop loading material into your tumbler. This isn’t as easy as it sounds as the amount of material in the barrel decreases in volume as the process proceeds. There’s always room for one more pail of kitchen scraps or another bag of grass clippings. But adding more material sets the process back and you might find unfinished carrot peeling or chopped celery garnishing your compost when it’s otherwise complete. This makes for good reason to have a second tumbler or a nearby heap to hold materials while a load is being finished (yes, dear, I promise not to take my own advice). The stand-by pile goes into the tumbler as soon as it is emptied. A household size composter for daily amounts of kitchen and household throw outs — finished compost in 4-6 weeks! The Back Porch ComposTumbler is great for your deck, porch, right outside your kitchen door or next to your recycling bin. Capacity: 32.2 gallons (4.3 cubic feet). How you turn your compost also has an effect. Don’t just rotate it once and consider the job done. Swing it back-and-forth a number of times after each spin to shake up the materials then spin it again. The axle on which the barrel rotates goes through the center of your tumbler and help breaks up the compostable material as it’s turned. Paddles and piping in some tumblers have the same effect. Compost tends to become compacted as it forms. Several good turns will assure that your compost has been well broken up and mixed with air. This should be done a minimum of twice a week and three or four times a week isn’t too much. 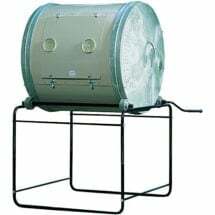 Spinning daily or more than once a day (your kids will be tempted since spinning a compost tumbler can be loads of fun) doesn’t give the compost a chance to attain maximum temperatures. While it doesn’t take long for heat to build inside a properly filled tumbler, too much tumbling dissipates heat and defeats the purpose. It’s easy to understand why your tumbler should be positioned in direct sunlight. Sunshine will help heat up what’s in your tumbler. The darker the tumbler, the more it will heat up. We’ve found that a digital, remote meat thermometer (sorry, dear, I promise to replace it in time for Thanksgiving) is a great tool for assessing temperatures inside your tumbler. 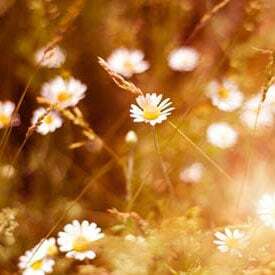 Any reading short of 130-140˚F means you’re probably not killing weed seeds or getting optimal decomposition (at their most efficient, compost tumblers and bins can generate temperatures as high as 200 degrees). Naturally, you’ll want to position your tumbler strategically so that the finished product is unloaded close to where it will be used. Following these procedures carefully will yield the promised results of finished compost in a month or so. How will you know when your compost is ready? My guess is that you know good compost when you see it. The original leaves, grass clippings and kitchen scraps have given up their identities to become dark, rich humus with good clumping ability (no too much moisture), texture and particle size. The volume of the material inside the barrel will have been reduced to half (or less!) of its original bulk. 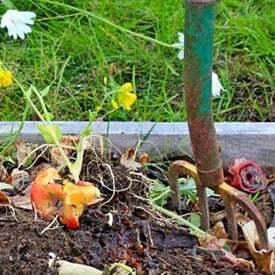 No finished compost is perfect and most gardeners will screen their finished product to remove the inevitable small twigs, woody carrot ends or other non-composted material. Ignoring even one facet of good composting practice may mean it takes eight weeks or longer for your compost to be perfect. It’s said that a well-managed pile will produce compost just as quickly as a tumbler. Such results are obtained by turning the piles as frequently as the tumblers (every couple days) and constantly applying moisture to the piles, something tumblers don’t require. To get the same results from traditional compost piles as from a tumbler requires significantly more work. And isn’t that why we use tumblers, to save time and energy? I purchased a compost tumbler years ago and found that the instructions for getting “2 week” compost involved using sawdust and organic material. This was not practical for me so I began to “harvest” the fall leaves, grinding them to fine particles with my leaf blower/vacuum. I do not use grass clippings as I do not collect them. I collect my kitchen waste in a large bowl, when it is about half full I add water and use my stick blender to emulsify, then add that to the tumbler. Works very quickly in the summer. People in Maine have been using plastic black trash cans with lock on lids for years. The kids find it entertaining to roll the trash can around in the yard. I need all of the help I can get,I just purchased my first composter.I would appreciate any info I can get. It sounds like you guys arte on top of your game. thanks Jess. Want your tumbler to really heat up? Once you have your ingredients in the tumbler sprinkle them with a mix of water and molasses. I make a mix of 5 litres of RAIN water and a cup of molasses. Don’t get the ingredients too wet. Give the tumbler a few turns to spread the mix around. I make compost in less than 10 days. I like the molasses trick. I purchased a dual barrel composter (Lifetime brand) from Costco. So far, things have turned out the way I’d hoped. First, assembling the thing was a bear! I’ve never seen so many parts. I finally finished after what must have been 5-6 hours. I am using shredded paper from a shredder, food wastes, and sawdust in the barrel. I’ve wetted it down sufficiently but no puddles. After a couple weeks, nothing except lots of gnats flying out every time I opened it. I added “compost starter” a few weeks ago. Still no visible breakdown I can detect, and lots more gnats. I have been turning it daily. And the vent pipe in the middle gets clumps of the stuff on it covering the holes, which I brush off. You can try adding mushroom or manure compost. I have dual tumbler from Costco as well and it looks like mine is working. Adding blood meal or bone meal might help as well. The proper moisture ration is the key. It sounds like the problem is that you’re mixing too often. Mix once ever 2 days is what I’ve read. Also, are you covering the compost with brown material after you turn it? I had tons of flies and started covering it with brown material after reading online and found that the flies went away really fast after that. Place your food scraps in the freezer for at least a day. You will soon be Kant free. Thanks for this article! I just started gardening this year and I bought a used tumbler composter to try my hand at composting. I have never composted before. This was immensely helpful. I started it off with some leaves, kitchen scraps, coffee grinds, plants I’ve pulled, and I’m hoping to get my hands on some grass clippings. 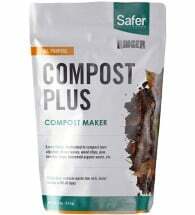 Hopefully I will have nutritious compost for my garden soon! I have a tumbler that I’ve been using for years, recently it has become infested with Roaches and Black Widow spiders, to the point where I don’t want to open it anymore. I can’t use poisons of course and I can’t just leave the door open or empty it as I don’t want them all to enter the house, it’s situated in the courtyard near the kitchen. Anyone have any suggestions?? Stop using food waste. Compost your food waste in a small indoor composter. 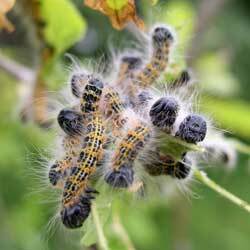 For the bugs use diatomaceous earth food grade. 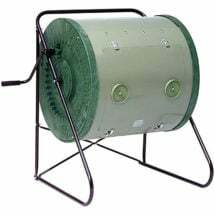 I’m getting a tumble composter tonight!! Does it need to be in the sunlight at all??? Just got a used drum composter from one of my postal customers today. I’m looking forward to trying it out and this article is very informative. I bought two compartments tumbler two months ago and started compost according to the recipe provided in the instruction: dry leaves (from the oak and bay tree, not chopped !!! Didn’t know) and kitchen vegetables scrap in the ratio 1 part dry brown to 2 parts of greens. I did by weight (Did I do Wrong?). Turning the tumbler every two-three days. All the green/kitchen stuff decomposes quickly (I do not see even the trace of it) but the leaves are still whole. The mixture doesn’t look like compost I used to have in the pile. And the temperature is low (not even in the active zone). I added a little water recently. The instruction which came with the tumbler didn’t mention adding water or soil, or shredding leaves…..
What shall I do now? Please, help with suggestions. Shall I keep adding kitchen green waste to the existed whole leaves? How to break them faster? Shall I add soil? Else? Galina I’d be shredding all the leaves etc through the lawn mower and add a shovel or dirt in there. If it’s dry enough I’d also add some water laced with molasses (as advised above). I have the same type of tumbler as you and I’ve been churning out a good amount of rich compost with this method. I compost as much as I possibly can because this stuff is garden gold! Oak leaves take a lot longer to break down in my experience. Not sure about the bay. Maple leaves break down much faster if you can find them. Thank you! Beginner here, so that’s good to know! I have large maple in front yard, so this info will get me off to a good start! I just bought first tumbler. Never composted before. Absolute beginner. So when compost is “ready” how do you store it if you don’t plan to use it right away? Does it have to cool completely before transfer to another container to prevent spoil? If perfect finished compost is damp, does it hurt to dry it out before storing? I put mine in aluminum garbage cans, (small ones) Bungee the lid on by the handles and put a black contractor bag (real thick strong bags) over it and let em bake some more. I do check every month (during the summer) for light moisture by inserting my arm to the elbow to check it. If it needs some misting for moisture, I dump it out on a tarp, mist it, leave it a couple days and put it back in. That way it all gets tossed around. Mine also sits outside all winter in Northern MN with no issues. I have 4-5 cooking each year besides my double tumbler and I have no issues with smell, bugs, ect cause I do dump it out to breath and get some water. Ive had a couple for 2 years I havent used yet. Im sure others will have much better ideas than I.
I have a mess in my backyard tumbling composter, and the compost is horribly wet and clumped together. We tried adding potting soil, but that didn’t help. Any suggestions? I have two 2-compartment tumbler composters, and I am getting a batch of finished compost every week. One of the main ingredients that I add which creates lots of heat is free coffee grounds from the local coffee shops. I also get vegetable/fruit pulp from a local juice bar. It takes me a week to fill one of the 4 compartments, and that one is full the first one that was filled 4 weeks earlier is ready to dump out. That empty compartment then starts getting filled as the other 3 are working to make compost. Since I don’t have enough “brown” material for all of that compost, I use the compressed pine pellets which I buy from the farm store in 40 pound bags – the pine pellets are made for horse bedding or cat litter boxes, but they are excellent for composting, too! Larry it sounds like you have composting licked. Well done. What sort of a garden do you have and what difference does the compost make?